Senator Royce West of Dallas authored the bill to create a grant program to help local law enforcement pay for body cameras. (AUSTIN) — A bill that seeks to create a framework for the use of body cameras by police officers was passed in the Senate Thursday. These cameras are designed to be worn by officers to record interactions between police and members of the public. Several controversial lethal force incidents in other states, some recorded and some not, have led to strong public debate about the role of video evidence in police work. 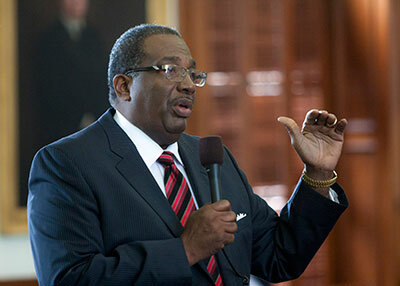 Bill sponsor Senator Royce West of Dallas said that the fraying relationship between the public and law enforcement must be repaired. "There's been an erosion as relates to how people feel about our criminal justice system," he said. "We must restore credibility and trust in our law enforcement agencies." SB 158 does not mandate that police departments adopt the use of body cameras. It does create a grant program at the Office of the Governor that local law enforcement agencies can apply for to help offset the cost of purchasing equipment. West said he is working with Senate budget writers to find $10 million in state money to put into the grant program. Additional money could be pulled down through federal programs, and the bill requires that the applying agency cover twenty-five percent of the cost. The bill also requires that if a police department decides to use body cameras, they must also adopt a written policy governing the use of cameras. Though it doesn't stipulate what these policies must be, West said that departments using body cameras should adhere to a uniform policy. During debate over the bill, West spoke of the pushback he received when he carried the bill requiring dashboard cameras in police cruisers. Opposition to the program was harsh then, but now he says, police officers won't leave the station without them. West argued that documenting encounters between police officers and citizens reduces complaints against police, incidents of lethal force, and lawsuits against law enforcement. "People act different on camera," he said. Also Thursday, the Senate approved a measure that seeks to give school administrators flexibility under zero tolerance policies. Adopted in Texas in 1995 as a way to improve school safety, zero tolerance policies require immediate suspension for students caught at school with drugs, alcohol or weapons. Senator John Whitmire of Houston said that sometimes contraband items are accidentally brought to school, resulting in a harsh punishment for a simple mistake. He cited examples of students suspended over a small pocketknife or a shotgun shell in a backseat left over from a hunting trip. His bill, SB 107, will allow school administrators to consider intent in such cases, in an effort to avoid mandatory suspensions when they may not be warranted. "I think it will go a long way to protecting our campuses but using some common sense in the way that it's administered," he said. 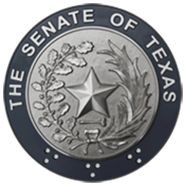 The Senate will reconvene Monday, April 27 at 2 p.m.